This album was recorded with a studio audience present and without rehearsals and formal arrangements, and it is a testimony to the power of spontaneity in jazz when favorable conditions and inspired personnel are present. 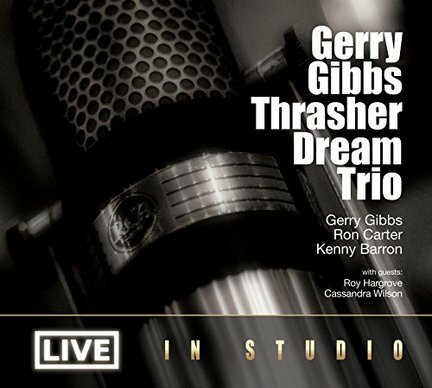 With a repertoire of tunes mainly from the ’50s and ’60s, drummer Gerry Gibbs’ trio, which includes veterans Kenny Barron (piano) and Ron Carter (bass), creates a masterful example of straight-ahead jazz. Guests Cassandra Wilson (vocals) and Roy Hargrove (trumpet and flugelhorn), who appear on three and four tracks, respectively, up the ante. There are 16 performances, with “Watch What Happens” appearing twice, once as a trio feature and once with Wilson added. Wilson also sings a sultry “The Look of Love,” which shifts into a hard-swinging section for Barron’s solo. It’s here and on several other performances (“The Surrey With the Fringe on Top,” “Cast Your Fate to the Wind,” “More,” “Girl Talk,” et al.) that Carter’s irresistible driving beat lifts you out of your seat. It’s worth listening to this set and focusing exclusively on his lines. Likewise, Barron’s playing is full of ingenuity: the slow-walking groove of “Girl Talk,” the developmental lines on a fast-paced “Wives and Lovers,” the dark harmonies of “The Summer Knows” and the empathetic support for Wilson’s whispered vocal and Hargrove’s flugelhorn solo on “Alfie.” Hargrove also performs a Miles Davis-like Harmon-muted trumpet version of “On a Clear Day,” a fast-paced “Charade” and, on flugelhorn, a harmonically rich “What Are You Doing the Rest of Your Life?” Gibbs, the visionary behind this trio and the improvisational scheme of this album, solos infrequently, but his drive, various grooves and swinging touch prove that he’s in the right company.